Everybody loves Potatoes, but not everyone knows about the 8000 year journey from 4000 feet high in the Andes Mountains, to being the number one side dish for millions of people worldwide. Behind wheat, corn and rice, The Potato is the 4 largest food crop grown globally. Pound for pound the potato packs a much higher nutritional punch than most other agricultural crops. Because of the well rounded nutrition that it can provide, a person can live indefinitely on potatoes alone. The path of the potato through time is easily traced by the prosperity it creates and the rise in the standard of living for those clever enough to utilize its enormous potential. Where ever the potato goes, it brings with it the ability to provide food security for the growth of Nations. The Potato Plant, also known as Solanum Tuberosum is an herbaceous annual that produces starchy edible tubers. The Potato comes from the Family Solanaceae which contains Nightshades, a group of flowering plants that are prized for their nutritional, medical and psychotropic qualities. Tomatoes, Eggplant, Bell Peppers, Chili Peppers, Tomatillos, Tobacco, Belladonna, Jimson Weed, Mandrake and Gooseberries are all part of the Nightshade family. 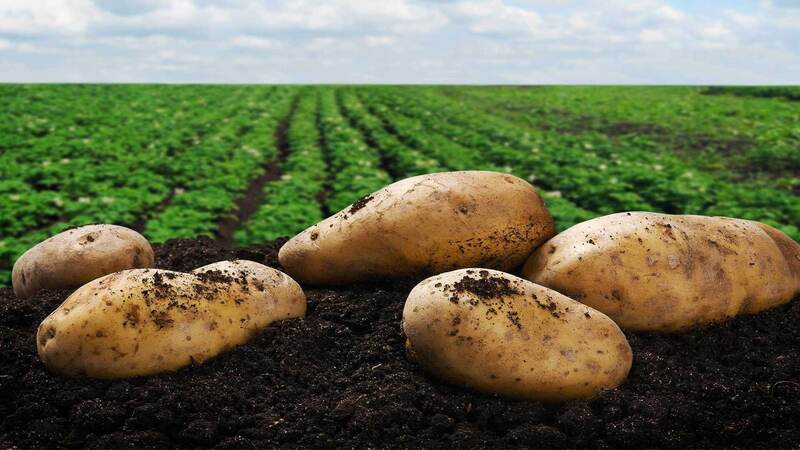 Potato plants can grow to be up to 40 inches tall, they have large compound leaves that produce starch that is fed to their underground stems called stolons, which then enlarge to become tubers. They also have flowers that can be anywhere from white to pink, blue to purple and have an inedible berry that contains seeds for genetic variation. When mature, the potato plant can produce up to twenty tubers. Being an herbaceous annual, a potato goes through its entire life cycle in one season, needing to be replanted from seed every year. Instead of being planted from the true potato seed that comes from the potato berry, commercial potatoes are planted using pieces of older potatoes containing eyes, which makes a genetic replica of the potato planted before. These ‘Improved’ Seed Potatoes are prized for their ability to keep the favorable traits that have been bred into the parents. The reason that a Potato is botanically classified as a Tuber and not a root crop is because it is a swollen piece of stem that is underground and not its roots, like a sweet potato. A potato is a nutrition powerhouse, 100g of potatoes contains more than half your daily requirement of vitamin C and has more potassium than a banana. They are rich in B- vitamins, calcium, phosphorus and iron as well as containing high quality proteins that have amino acids that must be ingested whole and can’t be put together. Potatoes also have a high carbohydrate to protein ratio, so if you are eating enough potatoes for your energy requirement, you are getting enough protein for your body. Meaning you can be healthy consuming potatoes as your main food source. From French Fries to Mashed Potatoes, the spud has always been a plentiful option for the modern consumer. But do you know where your potatoes come from or how they are so readily available? The potato has had a difficult journey through time. Being related to the poisonous Nightshade Family and once called “The Devils Apple” the potato rose above its bad reputation and is now seen as a staple food crop that can feed the world and help reduce poverty and end hunger. Potatoes are easy to grow and have more edible biomass than other agricultural crops. Cereals and Grains only have one third of their entire weight be able to be eaten, while the potatoes edible biomass is over three fourths of the plants weight. Meaning that potatoes more efficiently use land, water and labor resources to produce more energy in the same amount of area. One hectare of potatoes yields up to four times the food quantity of grain crops and seven times more efficient using water than cereals. The once feared potato is now the nutritional champion that has helped mold society wherever it is grown. The potato was first domesticated over 8000 years ago in the high elevation regions of the Andes mountains in Peru. The Incan empire was one of the first civilizations that benefitted from the resourcefulness of potatoes. Their empire stretched across South America and had a large network of roads and irrigation connecting the cities. The Incan Legacy is visible in the pyramids they built and the gold and artwork they left behind. In 1532, Spanish Explorer Francisco Pizzaro was led to the Andes in search of gold. Not only did he find gold, but he found small edible tubers that helped prevent scurvy and made their way onto Spanish ships. When the potato was first brought to Europe it wasn’t given a nice greeting. A book called The Phytopinax was published in 1596 claimed that potatoes caused leprosy and wind. In other places they were thought of as an aphrodisiac and caused lavicious behavior. It wasn’t until the necessities of war that potatoes began to see in a favorable light. Invading armies would 17th and 18th centuries teach townspeople that even though they destroy what is on top of the land, they still have the tubers underground. Once farmers started growing more potatoes they had a surplus of time for other endeavors and began moving more toward a profit driven society. People had more time to invest in new skills, trades and the arts. This was thought of as the Agrarian Revolution which was the forerunner of the Industrial Revolution. Once more countries learned of the potatoes agricultural properties they too began to grow them and eventually became dependent on them as a sustenance crop. Ireland became completely dependent on potatoes in the 1800s and in 1845 the entire Irish potato crop was attacked by an unknown disease that was later identified as Late Blight. Over one million Irish starved to death and even more emigrated from the country. Ireland had a dominant potato variety called the Lumper, which had higher yields but was susceptible to disease and pests. Because of the amount of potatoes it produced it eventually became the only potato grown in Ireland at the time. It was because of this that the famine had such a swift and strong impact. The lack of plant diversity let to all of the crops being taken out at the same time, causing catastrophic effects. The need to protect and save the potatoes from pests and disease was part of the beginnings of the modern agrochemical industry. It also led into the pioneering of genetics because scientist were in a hurry to breed better varieties of potatoes. Originally plants randomly cross bred themselves, but it became essential to have improved plants in less time. So people began to deliberately crossbreed to carry on better traits from the parents. The most well know potato variety, The Russet Burbank was an accidental cross breed that ended up being the number one potato in production in the United States. The new goal of the potato is to end hunger worldwide. The International Potato Center in Peru, also known as the CIP, is working to study, protect and utilize plant diversity in order to create sustainable agriculture systems that can ensure food security and increase incomes in poverty stricken countries. Crop genetic diversity is under pressure from urban development, disease and climate change. The loss of diversity makes plants more susceptible to diseases and pests. The CIPs strategy is to bring good seed stock to farmers in developing nations and show them how to grow potatoes in the most efficient way possible. The potato has come a long way from being s sustenance crop only grown in the Andes Mountains. To now being the world’s new hope for food security. In the past potatoes have helped many during the ravages of war and famine by providing a cheap, nutritious food stuff. Potatoes have also helped bring about many advancements in Industry and Science, helping fuel the Industrial Revolution and beginning the journey into modern genetics. The next time you sit down to eat potatoes remember not to take for granted the little tuber that can save the world.